Canker sores are ulcers that commonly occur inside the cheeks, inside the lips, on the tongue, and on the soft palate (back of the mouth). An ulcer is an open sore inside the mouth, which is painful and inflamed. The condition is referred to as recurrent aphthous stomatitis (RAS) and is characterized by recurrent ulcers in an otherwise healthy individual. Ulcers will usually last about 10 days. There are three forms of RAS that are distinguished by the number and size of the ulcers: major (see Figure 1), minor (see Figure 2), and herpetiform (rare). RAS is common, but how it affects people varies. Ulcers will usually last for about 10 days, and ulcer-free periods will depend on the frequency of attacks. Some people experience only one ulcer occasionally, while others have continuous ulcers. RAS is uncommon in the harder (keratinized) areas of the mucosa such as the gums (gingivae) and roof of the mouth (hard palate). Canker sores affect both men and women with a slightly higher frequency in women. The condition is most frequent in young adults although it does occur in children. What is the difference between cankers and ulcers caused by herpes virus? Mouth ulcers due to herpes virus can occur as a primary infection (see Figure 3) or a secondary recurrent infection (see Figure 4). Almost everyone has been exposed to herpes virus and few experience a primary infection. A primary infection is characterized by many small blisters that quickly break and form yellowish ulcers. These join together to form larger irregular painful ulcers. The ulcers are painful and can make eating or drinking difficult. This in turn can lead to serious dehydration and the need for urgent medical care. The infection will usually run its course over a 1 to 2 week period. A primary infection is more common among children and is associated with swollen glands and fever. 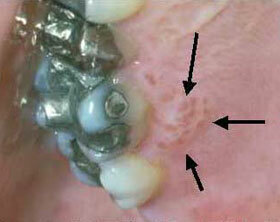 The recurrent form is more common, affecting the hard gum of the roof of the mouth or near the teeth. The ulcers start as blisters. After the blister breaks a shallow ulcer is formed, surrounded by a red area of inflammation. The ulcers will heal in 1 to 2 weeks without scarring. This most often occurs in young people who have never before been exposed to the herpes virus. Small blisters form throughout the mouth and quickly form ulcers (illustrated in the photo). These last for approximately two weeks and heal completely. The ulcers can be painful and make eating or drinking difficult. After being exposed to the herpes virus a small percentage of people experience recurrent episodes that most often are located on the hard palate (roof of the mouth) or the gingiva (gum). The infection first appears as blisters that (shown in the photo) that quickly break and become ulcers. These last 1-2 weeks and heal completely until the next recurrence. A small percentage of people experience recurrent episodes, most often roof of the mouth or the gum. The infection first appears as blisters (shown in the photo) which quickly break and become ulcers. These last 1 to 2 weeks and heal completely until the next recurrence.